Sustainable forest management benefits people and the planet. The Fact: Sustainable forest management benefits people and the planet. While it’s true that collecting used paper and recycling it into new products is good for the environment, there’s a catch. The wood fibers in paper can be recycled only about five times before they get too weak and break down. That’s why we need fresh fiber harvested from responsibly managed forests, too. Using fresh fiber creates a sustainable cycle of high-quality recyclable material to continually replenish recycled fiber. And the paper industry’s perpetual use of trees discourages the sell off of land for development, encourages sustainable forestry practices and supports hundreds of thousands of U.S. jobs. Why do we need both fresh fiber and recycled fiber? How does using trees for papermaking help keep land forested and managed responsibly? Changing forest ownership patterns and the divestiture of large tracts of forest land by traditional forest management companies in particular, are important trends to consider when analyzing the loss of forest lands. A number of studies have shown that managing forests for timber production can enhance biodiversity and other ecosystem services in certain settings (Gustafson et al. 2007; Miller et al. 2009). Moreover, where profitable, timber management and the revenues it generates can serve as a hedge against the conversion of forest land to other uses such as real estate development, although the extent to which it can actually do so in the face of rapid increases in land values close to urban areas will vary. If I have a choice, isn’t using recycled content always better for the environment? 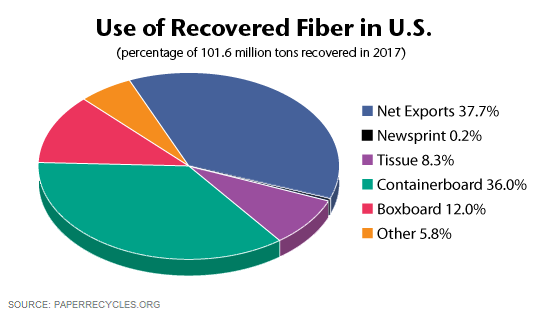 Determining the best use of recovered and virgin fiber for any paper type— including magazine grades—requires a life cycle perspective with an evaluation of the environmental, economic and technical considerations along the entire supply chain. This includes understanding where fiber is coming from (source), how the paper is made (manufacturing), and how effectively fiber can be utilized depending on the paper type (use). Converting recovered paper into usable fiber requires a level of processing, the extent of which depends on the end product. Some paper and paperboard products (such as newsprint, kraft bags and corrugated containers) typically don’t require a high degree of brightness and, because less cleaning and bleaching is required, these grades can make efficient use of recovered fiber. The brightness and cleanliness specifications for some [higher-quality] grades of paper, such as reprographic and laser print office papers, require additional processing – more cleaning and bleaching – of any recovered fiber used to produce them. As a consequence the manufacture of these products can be more energy intensive. Beyond a theoretical tipping point (probably somewhere between 30 to 50 percent post-consumer fiber content), using increasingly higher percentages of recovered fiber can result in diminished environmental returns because additional processing required could be more fossil fuel intensive and emit more greenhouse gases than avoided. How does making paper help the U.S. economy? 2 WBCSD and NCASI, 2005. 3 USDA Forest Service, 2010. 7 Direct Communications Group, 2010.